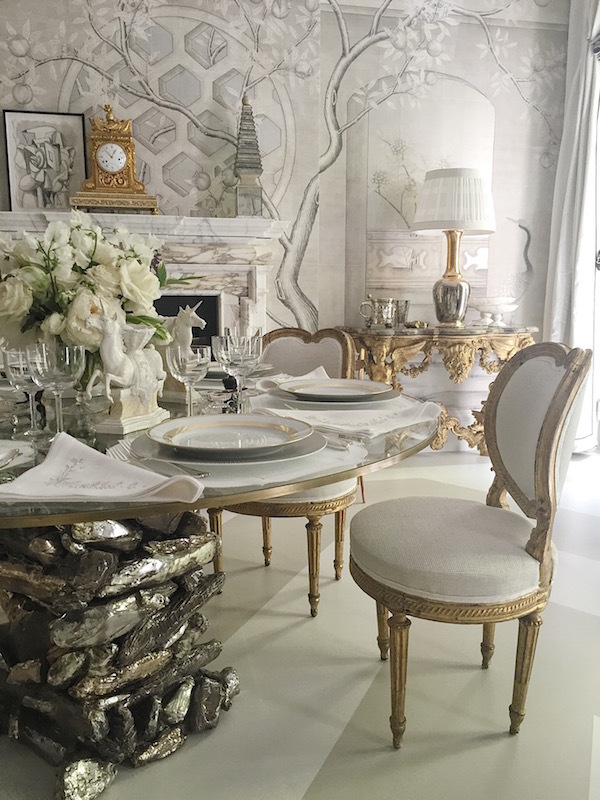 Enter Alex Papachristidis‘ Kips Bay Show House dining room and you are transported to a tour de force of enchanting elegance. 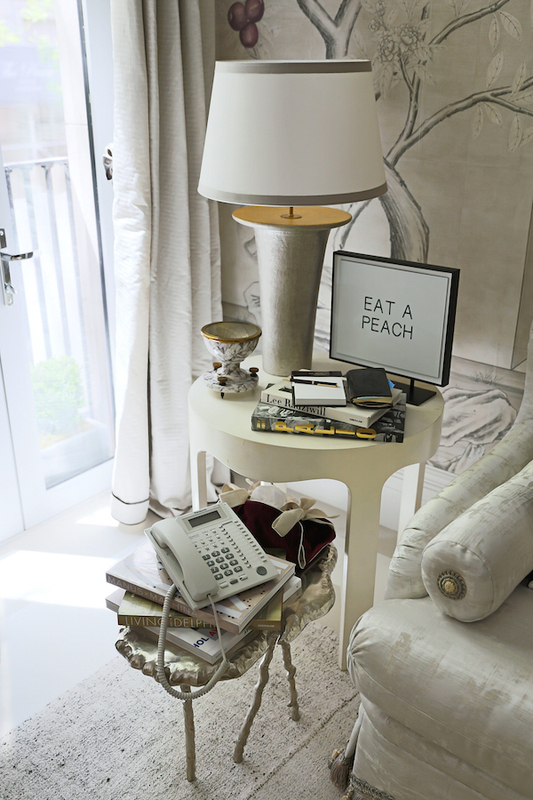 Shades of such early 20th century design titans as Elsie de Wolfe and David Adler and the high style of Mona von Bismarck are evident but you never completely lose sight that you are enveloped in a luxurious lair of modern living. The room began with the bold graphics of the painted chevron patterned floor, partially covered by a Beauvais rug made of Turkish tent panels sewn together to form a stripe. Some may see the world through rose colored glasses but I’ll take the divine tonal beauty of this room enveloped in custom Gracie wallpaper. 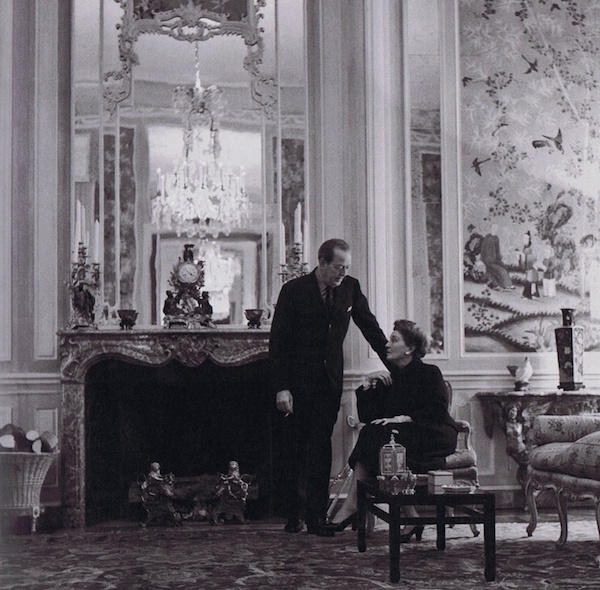 Based on the original Elsie de Wolfe design for the Condé Nast ballroom, Alex had Gracie execute it in grisaille and blow up the scale and proportion for maximum drama. In the final approval stage for the wallpaper, Alex’s partner Scott Nelson suggested that a bit of color might be in order, so the designer added subtle plums and purple peonies and butterflies – a slightly exotic, magical addition. And for a whimsical surprise, Alex had Gracie hand paint the backs of several dining chairs with the exquisite flowers. The bones of the room are augmented with architectural additions by Fairfax and Sammons. Crown molding matches the windows in the wallpaper and gutsy yet elegant door casings and high baseboards anchor the space. Alex is a master of melding timeless classics with the best of contemporary craftsmanship and this room is an ode to his love of the decorative arts, antiques and fine artisanship, all incorporated in a modern manner. Lalanne pieces stylishly pepper the space. 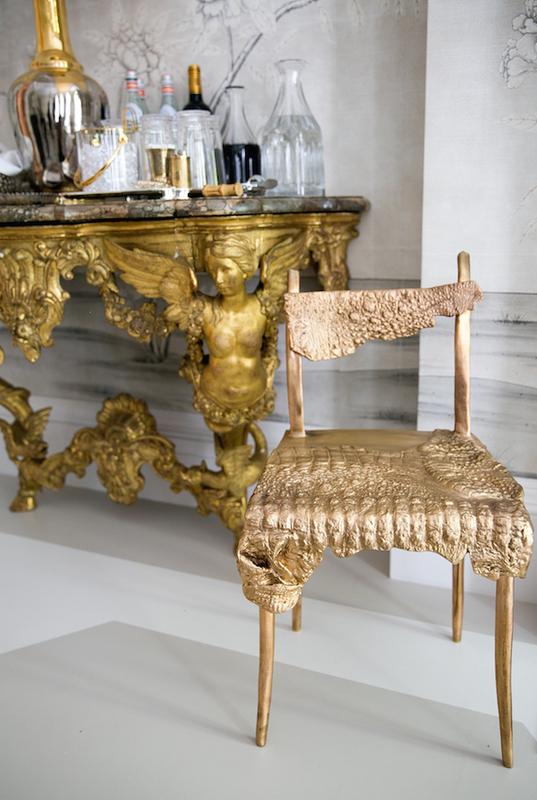 Chair, above, alligator bench and candelabra, below, add sculptural gravitas, enhancing the glamorous gold and silver color scheme. 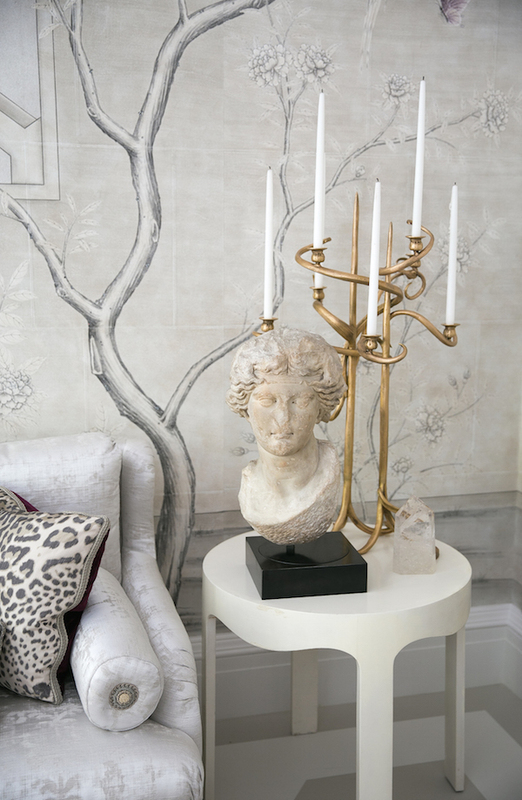 Covering the glorious walls would have been a sin so Alex added art and a sense of history with Roman antiquities from Olivier Chenel in Paris. 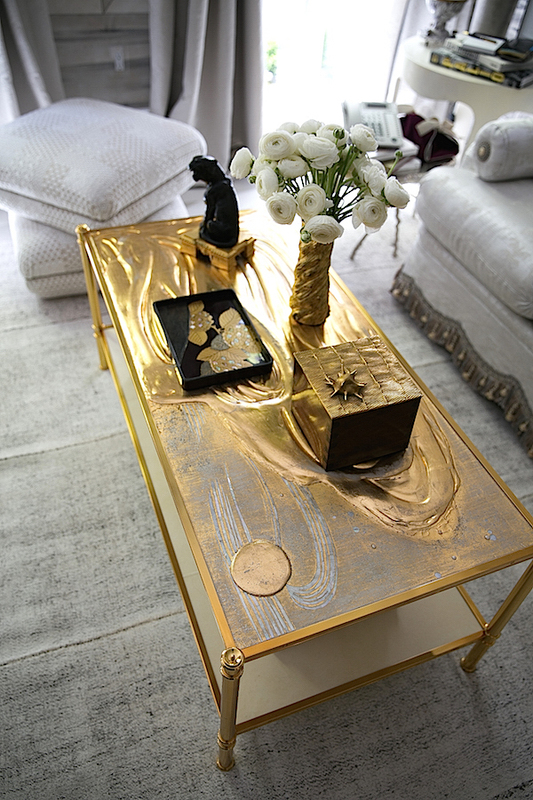 Contemporary ceramic artist Eve Kaplan made the monolithic table base with brass rimmed glass top. 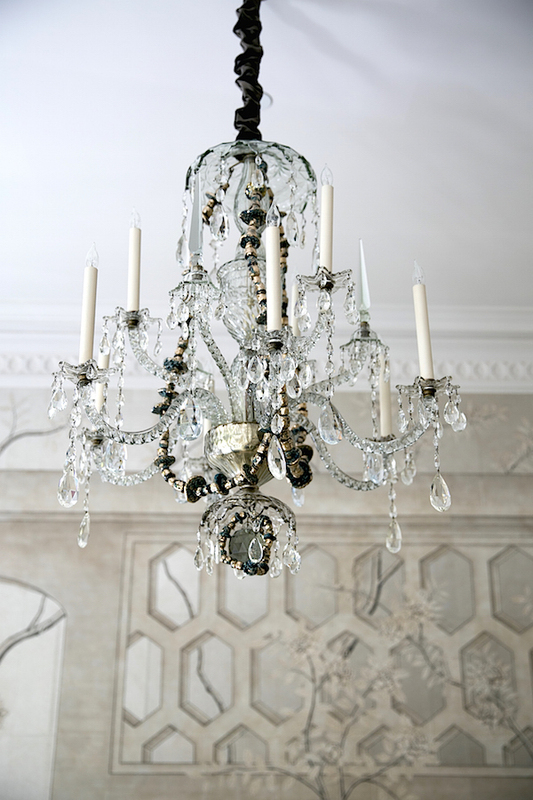 And to two Georgian crystal chandeliers from Gerald Bland, she made modern beads that Alex draped on the arms – like modern jewelry on a grand dame. 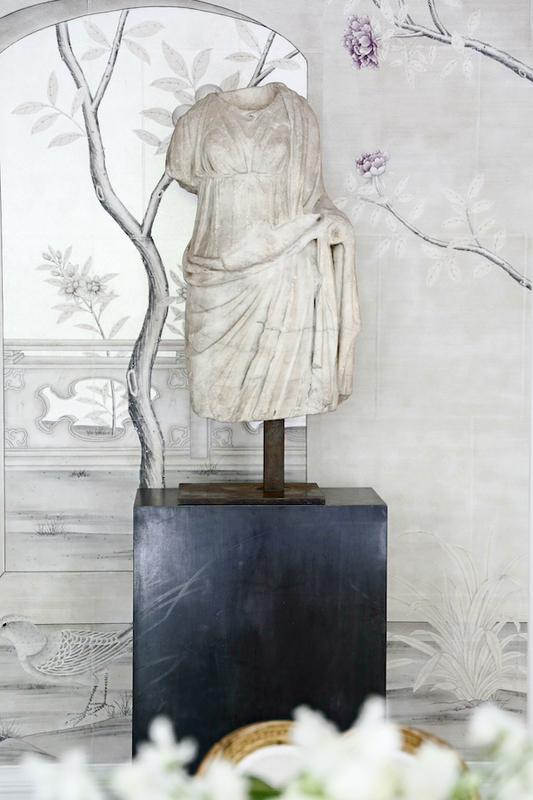 It’s all about using antiques in a modern way, presenting them anew to give them fresh life and vitality. 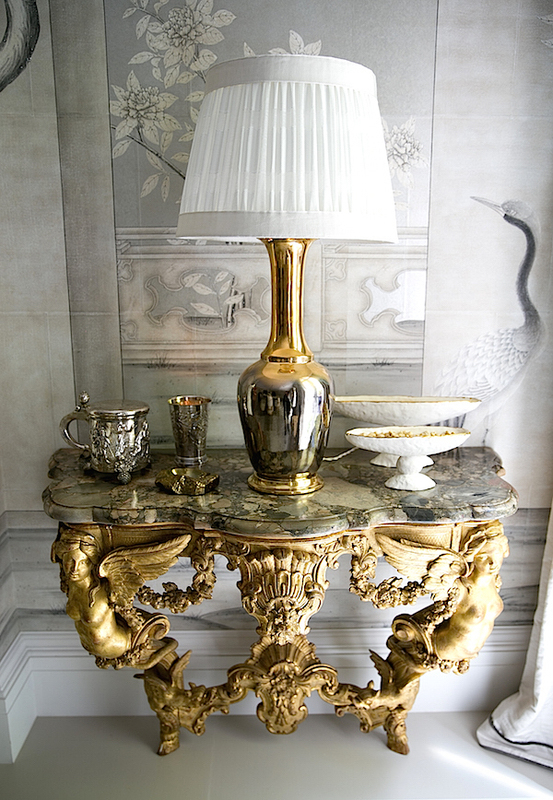 The amazing 18th century consoles from Dalva Brothers, after a design by le Brun, were originally in Mona and Edward von Bismarck’s Chinese room in their Paris apartment, below. You can see one to the right of the elegant countess sporting one of her many signature Balenciagas. 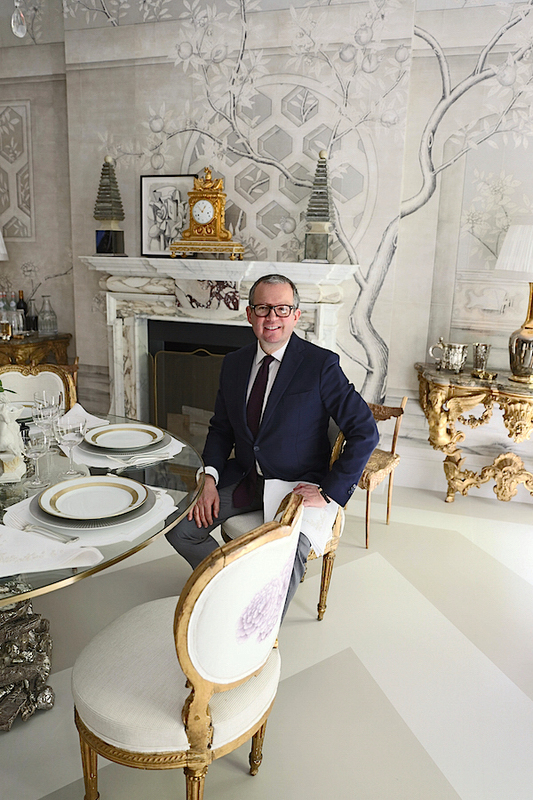 Alex outfitted the tables with alluring accoutrements, each topped with his AP Alex lamp for Christopher Spitzmiller in a chic new gold to silver ombre coloration and Chris Spitzmiller organic shaped tazzas. Alex designed the room as a multi purpose space that could be used not just for dining but as an inviting spot to meet and mingle with family and guests. 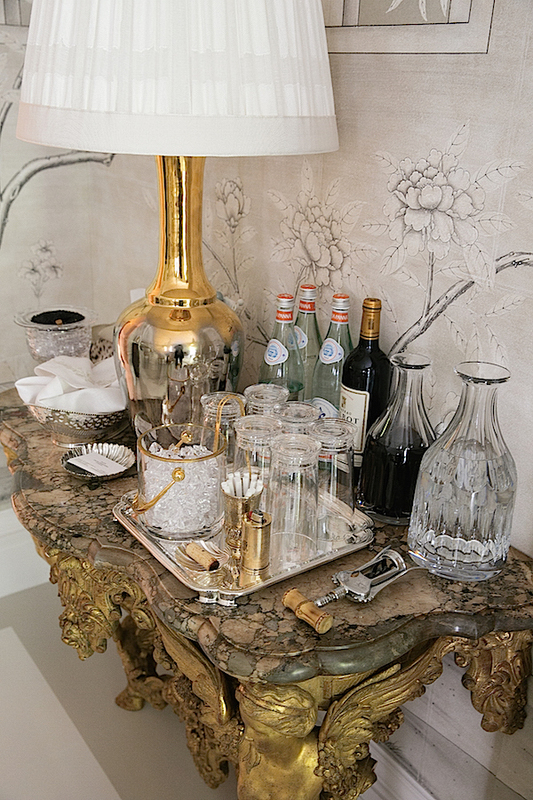 One of the consoles serves as a glamorous bar. 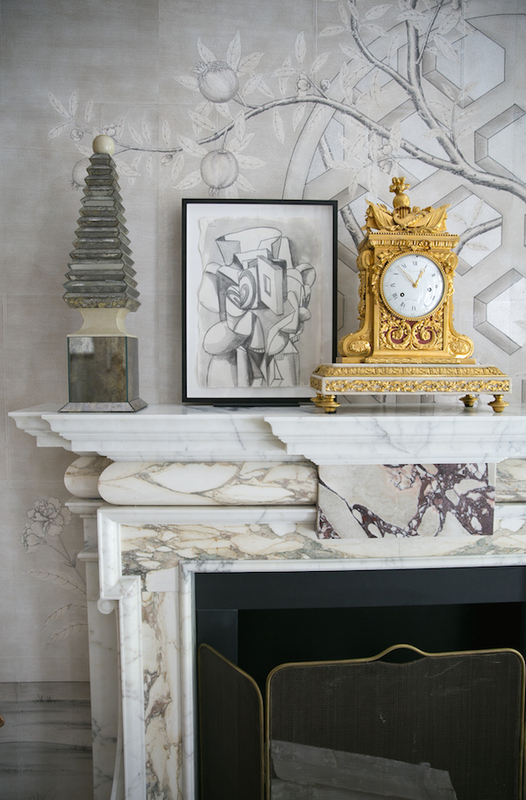 Samuel Marx 1940’s mirrored obelisks from Liz O’Brien, George Condo drawing (a loan from client Stafford Broumand) and an 18th century gilt bronze and marble French clock from the Chinese Porcelain Company grace the mantel with a stylish period mix. 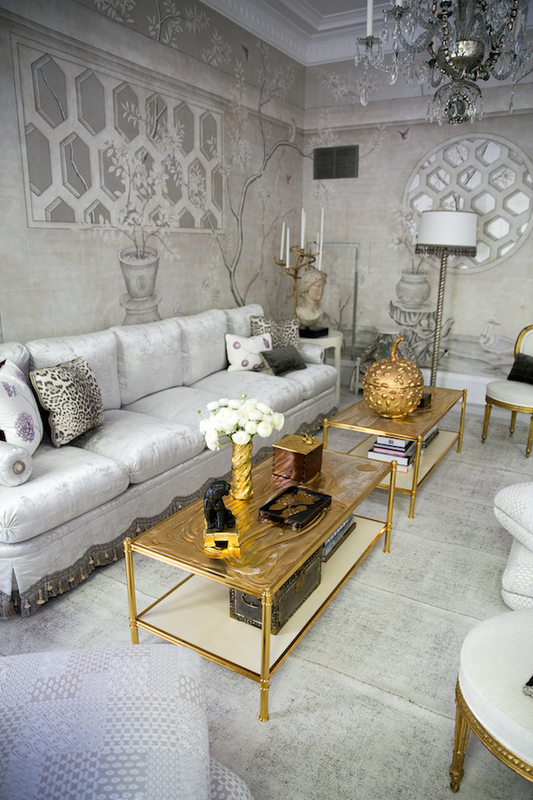 are enhanced by artist Nancy Lorenz, who created custom tops of mother-of-pearl, lacquer and gold leaf. The box is from a personal favorite, the multi-talented architect/artist/designer Achille Salvagni represented at Maison Gerard. 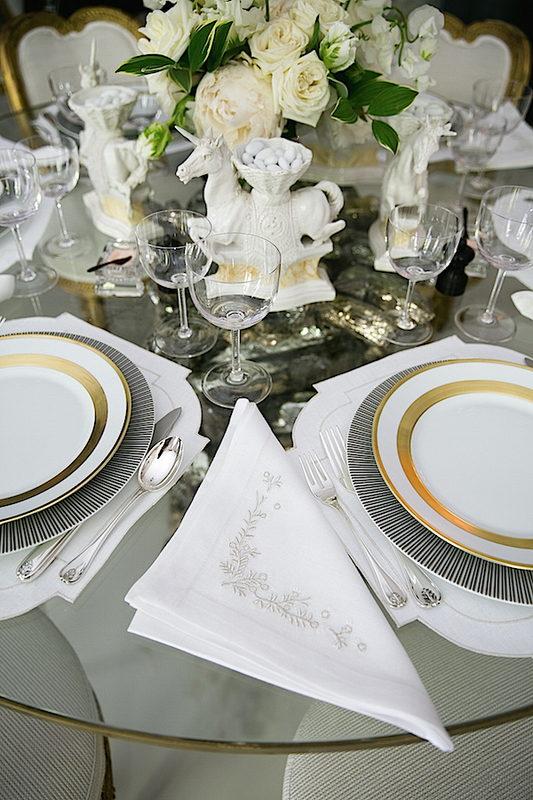 and beautifully detailed custom napkins and placemats from Leontine Linens. 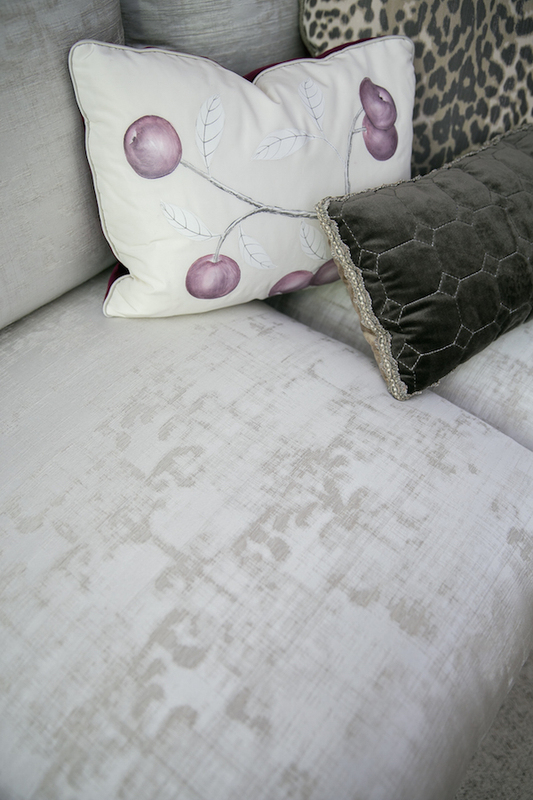 The comfortable sitting area features fabrics from Cowtan & Tout including a gorgeous new “water stained” silk damask and hand painted coordinated pillow custom painted by Gracie. 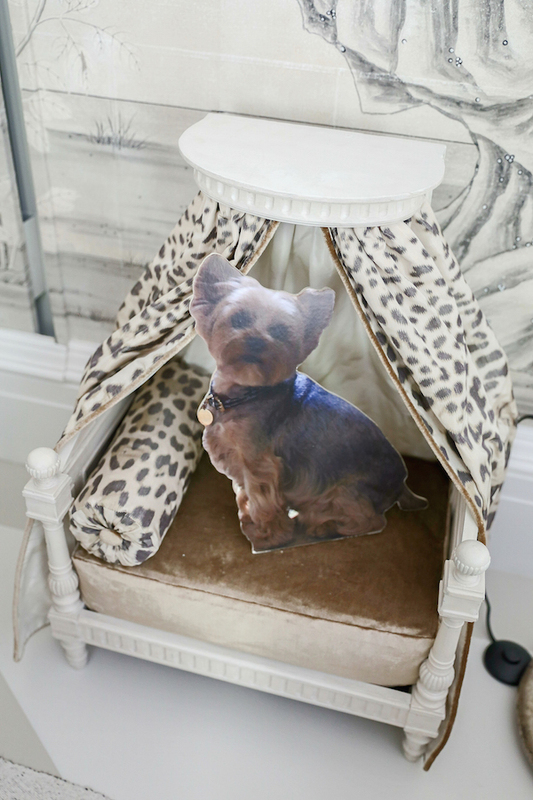 to the canopied dog bed from Louis Bofferding fitted with an image of the famous Teddy, Alex’s and Scott’s beloved yorkie. Thank you Alex for an elegant and luxurious take on modern living. It’s with a sophisticated creativity that you show us how to incorporate an important acknowledgement of the past with style, whimsy and fun! This entry posted in architecture, art, furniture, interior design. 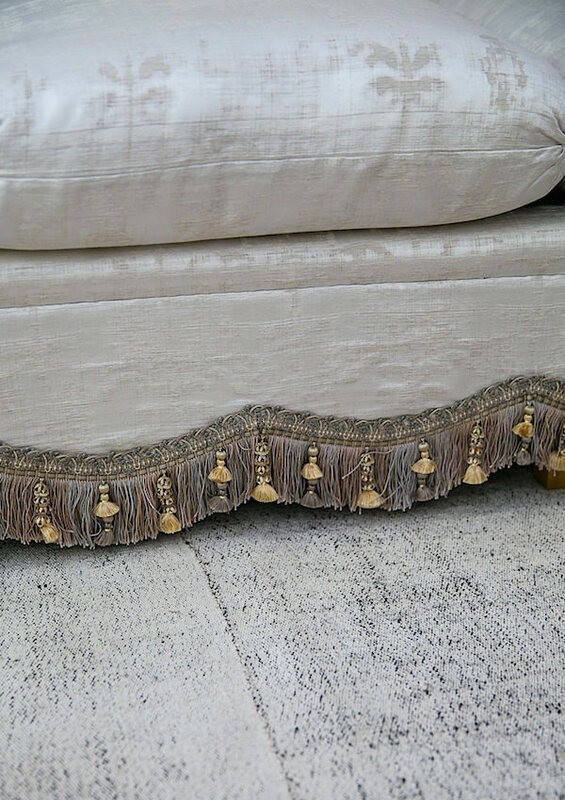 Entry Tags: Alex Papachristidis, interior design, Kips Bay Show house, Kips Bay Showhouse 2016 Bookmark the permalink. Yes, I would die for that alligator chair. Beautiful room. One of the most ravishing rooms I have seen in a very long time!! Fabulous room!! Best part — the candy dish — filled with candy of course! Mr. P. is the best host ever! Hoping for a YouTube video on the room and its inspirations! Amazingly designed room. Beautifully photographed and covered by Quintessence. Thank you! 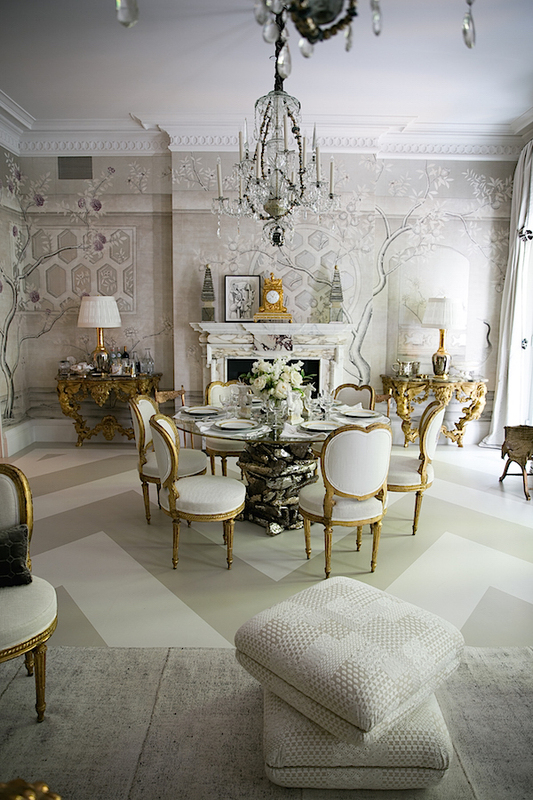 This room has taken my breath away… rarely does one see such pure luxe on a scale that is both large and yet intimate. Those consoles… and I adore the gourd … so much to take in and beautifully captured and documented by you Stacey! Bravo! 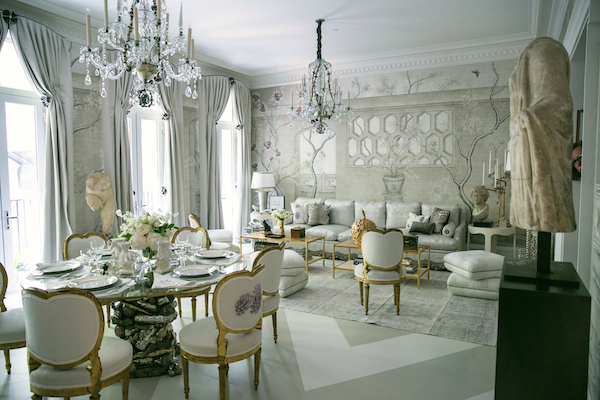 This room is beyond fabulous. Alex is a true master of elegance and style. His attention to detail sets him in a rarified category. Bravo Alex and thanks to you Stacy for your detailed coverage. What a beautiful room! I am loving the wonderful combination of gold and silver. A beautiful, elegant room, what an amazing design. Will you be featuring more from Kips Bay? I hope so, if not, can you please tell me where I can see some of the other rooms? Have a wonderful weekend. So fabulous – and your photography is just wonderful. It was so great to see you!! Wow, over the top!! I am heading over on Monday morning to check this out! Beautiful post!! You have completely outdone yourself with this magnificent photo journalism! The amazing array of detailed images in this room surpasses what is possible in print journalism. Thank you for taking us around this room as if we were walking in it. 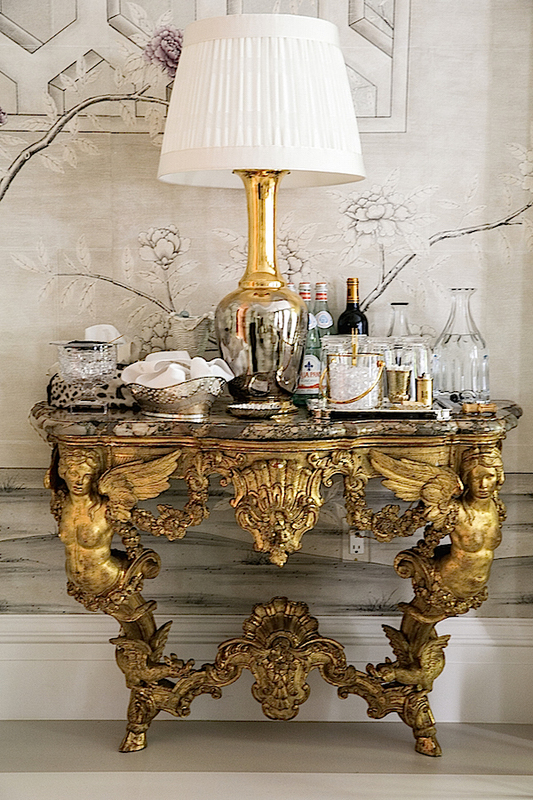 This is so important and such a revelation because this room by Alex Papachristidis is undoubtedly the best room in America now, having set a new bar for elegant grand style interiors, somehow lush yet witty, French, Modern, Chinese and all things gorgeous. I am planning to paint my floors immediately. Re color: Alex has solved a universal conundrum: how to give focus to those hundreds of soft grey rooms( and kitchens) one sees published and online, without resorting to black: gobs of gold, which everyone adores. This is the cutting edge now. 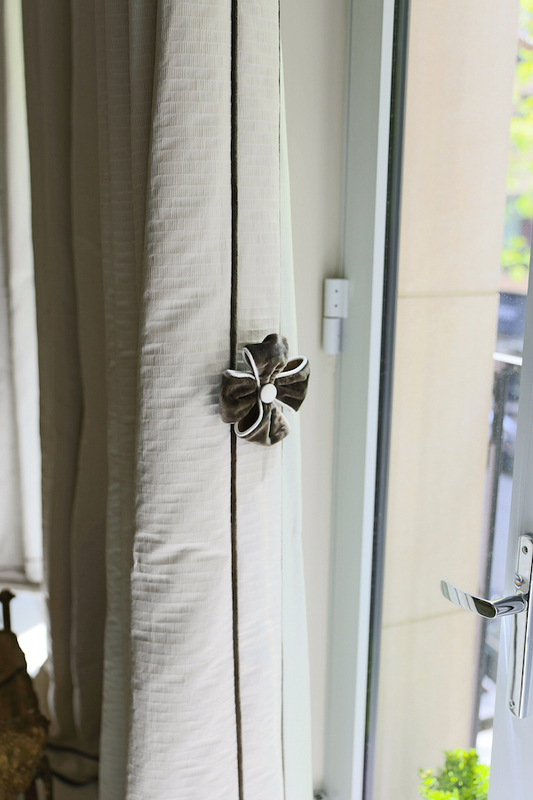 Absolutely gorgeous room and beautifully documented, thank you so much for this Stacey ! STYLE…sums up the whole! 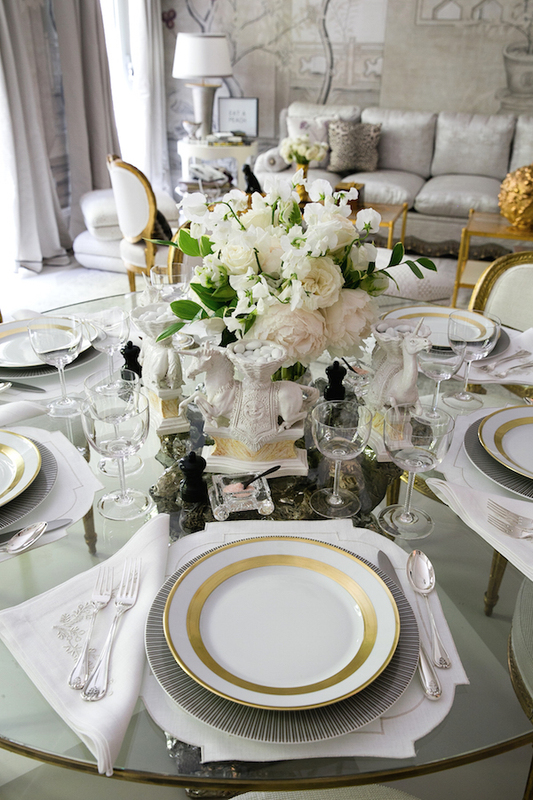 Your either born with it or not…and he aside from Ann Getty are truly tastemakers unto their own! Sheer brilliance, singular and transporting. Love ALL OF IT! 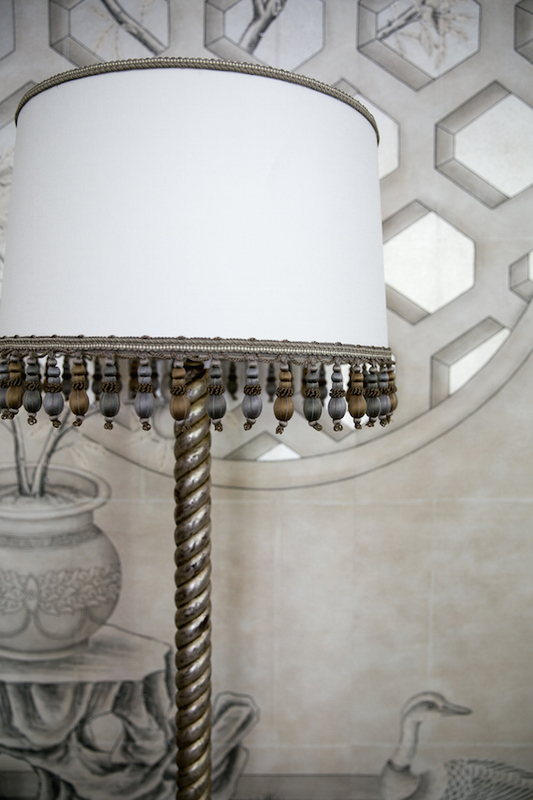 Thank you for covering all of the exquisite details of this room! I was just dying to know what the dining table’s base was made of. I never would have guessed it was ceramic. Fabulous! I also loved how AP embellished the already-dripping-with crystals chandelier with ceramic beads. So unexpected & delightful! Totally stunning! 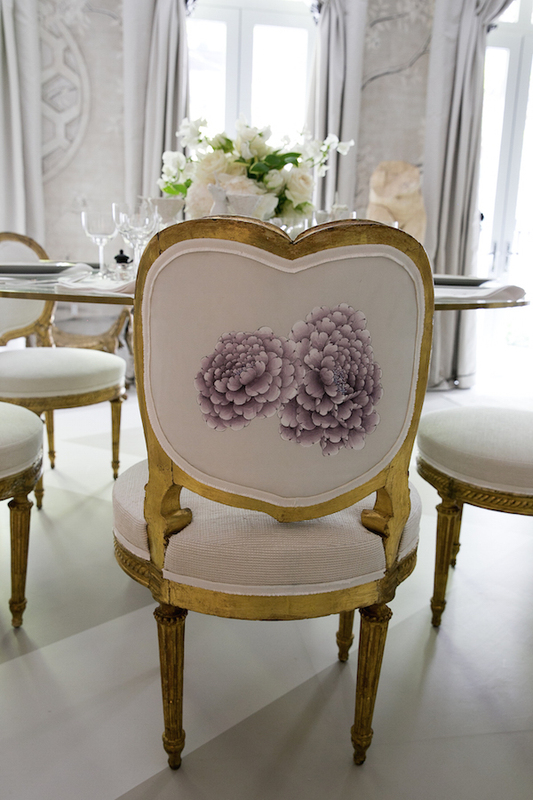 I cannot get over the gorgeous dining room chairs! Were they made for Alex or was he fortunate enough to find the wonderful set? 83 queries in 0.543 seconds.